The man in the photo is Pigpen (legal name: Ronald Charles McKernan). He was the front man for the Grateful Dead from the beginning in 1965 until shortly before his death from gastrointestinal hemorrhage in 1973. He was a keyboardist, a harmonica player, and most of all, a blues man. Although he grew up in San Bruno, California, he had the voice and persona of an old black man who’d lived a hard life in the rural Deep South. The Grateful Dead started as a jug band (Mother McCree’s Uptown Jug Champions), but with Pigpen at the helm, they were quickly singing the blues. If Pigpen wouldn’t have died when he was 27, the Dead would have surely been a very different band. While I was traveling with Mr. Carolina, we had no music. My van had no radio. Neither of us had a laptop or a tablet or an MP3 player or a music playing phone. When we picked up the Okie and Lil C, we got a little relief. Lil C had a phone onto which he could download music. I mentioned how I had really wanted to listen to “Estimated Prophet” while in was California, and those sweet boys got it onto Lil C’s phone for me. Mr. Carolina and I listened to it while stopped in a gas station parking lot, one ear bud in his right ear, the other in my left. Fast forward a few weeks, and the Okie and I were in Asheville, NC. We’d left Lil C at his mom’s house in Kansas City. I decided I wanted to go to Arkansas to dig quartz crystals. Mr. Carolina decided he wanted to dig quartz too, then convinced The Okie to travel to Arkansas with us. From there, we went to Asheville and on the Monday before Thanksgiving, we delivered Mr. Carolina to his brother so he could spend the holidays with his family. The day we dropped off Mr. Carolina? That was one of the saddest days of my life. We’d been together every day for a month and a half, and every day with him was a joy. Whenever I was stressed or upset, he’d remind me to breathe or hand me a flower. He never let me pump gas; if I was by the gas tank about to pump, he’d jump out of the van and run over to help me, take the nozzle right out of my hand. Whatever he had–food, money, friends, shiny rocks, weed–he was ready to share with me (or whoever else was around and in need). He always had a sweet, long, tight hug for me. He always thanked me for anything I did to help him. When we left him with his brother in the parking lot of a convenience store on the edge of Asheville, I felt as if I were leaving the nicest part of my life behind. So the Okie and I were in Asheville. The Okie was a sweet kid, with emphasis on the kid part. He was 19 and acted it. He interrupted me whenever I spoke. (One day in exasperation, I snapped at him, “Do you interrupt me all the time because I’m a woman, or do you do that to everyone?” He claimed he did it to everyone.) He asked to drive the van (a lot), even though he didn’t have a license. The one time we let him drive on a deserted country road, he drove too fast, even though Mr. Carolina mentioned more than once that he needed to slow down. He acted as if he knew everything about everything, even when he didn’t know much about anything. I had a lot of compassion for him. He’s been born to a young mom who ran off to California with him when things didn’t work out with his dad. When she got a new boyfriend, she shipped the Okie back to Oklahoma to live with her mom. After a few years, Grandma sent the Okie to live with his dad, a cop. That didn’t work out so well, and the Okie started getting in trouble and running away from home. By the time he was 15, he was living in St. Louis, hooked on heroine. He was clean when he was with us, but his emotional scars were obvious. He certainly wasn’t accustomed to his friends being generous to him. We had a loaf of bread and jars of peanut butter and jelly that we’d either been given by strangers or had bought with money given to us by strangers. It was for all of us. Whenever the Okie was hungry, he’d ask me or Mr. Carolina if we minded if he made a sandwich. The first few times he did this, he seemed considerate. We explained that the food was for everyone, that he should eat when he was hungry. After a while, his asking permission to eat got extremely annoying. Mr. Carolina started teasing him whenever he asked by saying no, he couldn’t have any food. I thought it was sad he didn’t trust that we really meant to share with him. So yes, I had compassion for the guy, but he pushed all my buttons and drove me crazy. It was as if I were his 41 year old mom and he were my 19 year old son. So we were in Asheville, with a huge quartz cluster we’d been given at the quartz mine in Mt. Ida. The thing had to weight at least 50 pounds. The Okie was convinced we could sell it to one of the downtown rock shops for several hundred dollars which I could use for needed repairs on my van. He was carrying it from store to store on his back in a huge Army issue backpack. As we were looking for one of the stores, the Okie asked an older guy in a tie dyed t-shirt for directions. The guy told us how to get where we were going, and the Okie offered to show him the quartz cluster. The guy was impressed and told us he had a stall in an outdoor market around the corner. The Okie asked him if maybe he’d be willing to trade for some quartz crystals fresh from the Arkansas dirt. The guy said he might be, to come to his booth when we were done at the rock shop. Unfortunately, we were not able to sell the cluster. We tried at two rock shops, and neither made us an offer, much less an offer of several hundred dollars, as the Okie expected. I wasn’t surprised. The cluster was gorgeous and magical, but it wasn’t perfect. There were a lot of nice points on it, but there was a lot of matrix too. For a rock shop to give us even $200 for it, the buyer would have to feel confident that the store could sell it for $400. I just didn’t see anyone paying that much money for it. The Okie hoisted the cluster-laden pack onto his shoulders, and we walked over t0 the older hippie guy’s booth. He had a lot of hand painted light switch covers, and several Grateful Dead pins. The Okie pulled out some of the nicer quartz points he had collected. The man accepted them, and the Okie said he’d like to have a Grateful Dead pin. While he was looking at the pins, I asked the man if he was interested in looking at any of my points. He nicely told me he didn’t need any more than he’d already gotten form the Okie. I stood next to the Okie and looked at the pins too, although I certainly didn’t have any money to buy one. (My pockets were so empty, I’d had to trade some of my points to a street kid for a handful of change to put in the parking meter when we’d arrived downtown.) I was just enjoying looking at them, and I was interested to see which one the Okie would pick. Also, during our time on the road, whenever conversation turned to the Dead, it had been Pigpen I sighed over. All the boys knew I had a little crush on him, so it was natural I’d be excited to see Pigpen and point him out. When I showed the pin to the Okie, he put down the one he’d been looking at and told the guy he’d take the one with Pigpen on it. Then he turned around and gave it to me! I tried to say oh no, I couldn’t, tried to tell him he should pick one out for himself, but he insisted on giving the pin to me. That is love! He did without something he wanted so he could give me something I wanted. I’ll never part with the pin. 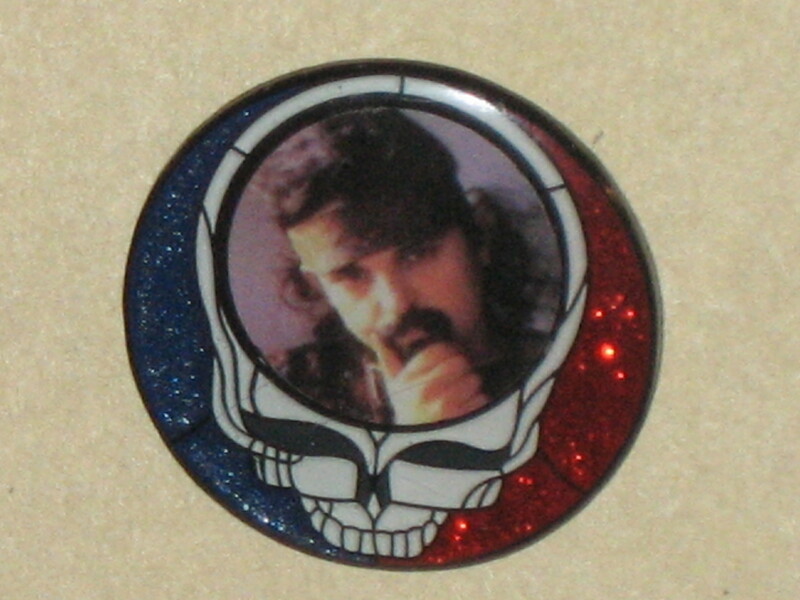 It’s not just the photo of Pigpen or the stealie’s cool glitter background that makes it special to me. What’s important about the pin is that the Okie loved me enough to give it to me. Thanks to http://en.wikipedia.org/wiki/Ron_%22Pigpen%22_McKernan for information about Pigpen. This is one of my favorite blog posts by you so far! It doesn’t matter how old one is; we all have some growing to do. I hope the Okie knows how much love you feel from his gift.